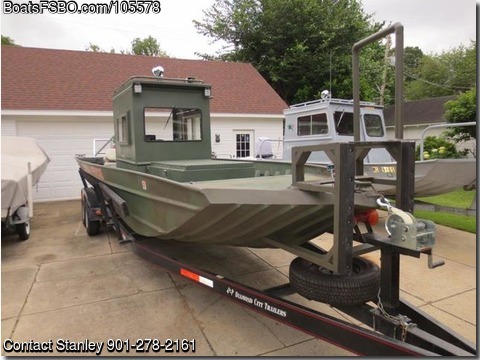 Contact the owner at 901-278-two one six one...Freshwater aluminum boat, low hours. 26' length X 96" width. Mercury 225 HP Optimax, 80 gallon fuel tank, HD sonar w GPS mapping, VHF radio w PA, search light, LED flood lights, trailer included. Nice boat for hunting, patrol, towing, search rescue, bow fishing or used as a work boat. Push knees at bow and outboard protection and towing bar at stern. Boat is in good running condition. No warranties are expressed or implied.